THRACE, Kingdom of, Lysimachos, (323-281 B.C. 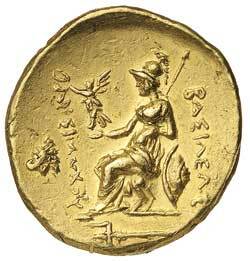 ), gold stater, (8.51 g), Byzantium mint, posthumous issue c.205-195 B.C., obv. 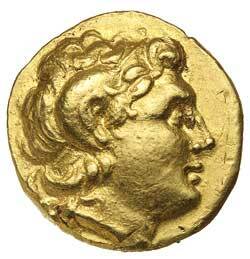 diademed head of Alexander the Great to right, wearing horn of Ammon, rev. Athena Nikephoros enthroned to left, holding Nike and resting left arm on shield, transverse spear resting against right side to right, to right **BASILEWS*, to left **LUSIMACOU*, lion's head to left in outer left field, trident below in exergue, (cf.S.6813, cf.Seyrig, `Monnaies de Byzance et de Calcedoine' [Essays to S.Robinson], No.7-10 [Plate 23], Marinescu Em. 47, 122.39 [O47/R116]). Extremely fine but virtually as struck, off centred on reverse, extremely rare. Ex Noble Numismatics Auction Sale 113 (lot 4804).